Chris Curran says Cliftonville run the risk of undoing their recent good work by dismissing the challenge posed by PSNI this evening. The Reds approach tonight’s League Cup Third Round tie (7.45pm) on the back of three consecutive wins and, seeking to build on Saturday’s sensational turnaround against Linfield, Curran says: “We won’t underestimate the threat that the PSNI will provide. “They’ll come to Solitude and try and make things very difficult. It’s important we show them the respect they’re due. You can read the full Curran interview in tonight’s edition of our Matchday Magazine, which will be on sale at Solitude for £2.50. 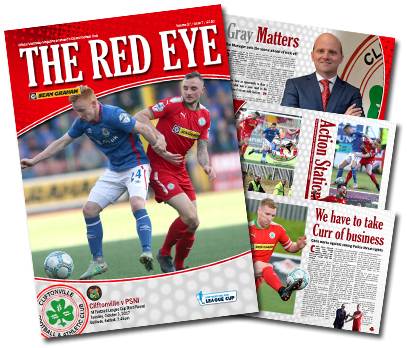 Alongside boss Barry Gray’s pre-game views, The Red Eye’s seventh issue of the campaign casts a glance at the Police, reflects on the weekend’s success and takes our traditional steps down memory lane – plus plenty more besides. Our Matchday Magazine, which has attained a top-three position in the NI Football Programme Collectors’ annual awards poll for the last six seasons, has recently undergone its first marginal price increase in many years to reflect its expansion in size and content and, if you’re not a regular reader, why not take a look at what you’ve been missing out on for the cost of just £2.50?